Converted from a cart shed this comfortable cottage offers peace and tranquility in a rural setting. Combined with electricity generated from a wind turbine and hot water from solar panels this eco-friendly property offers a holiday with reduced environmental impact. Stubbs Barn cottage has two bedrooms, a sunny and spacious open plan lounge, kitchen and dining area. The barn is set in seven acres of paddocks and gardens and your hosts, Martin and Jane offer you a warm welcome to enjoy the surroundings and local wildlife. 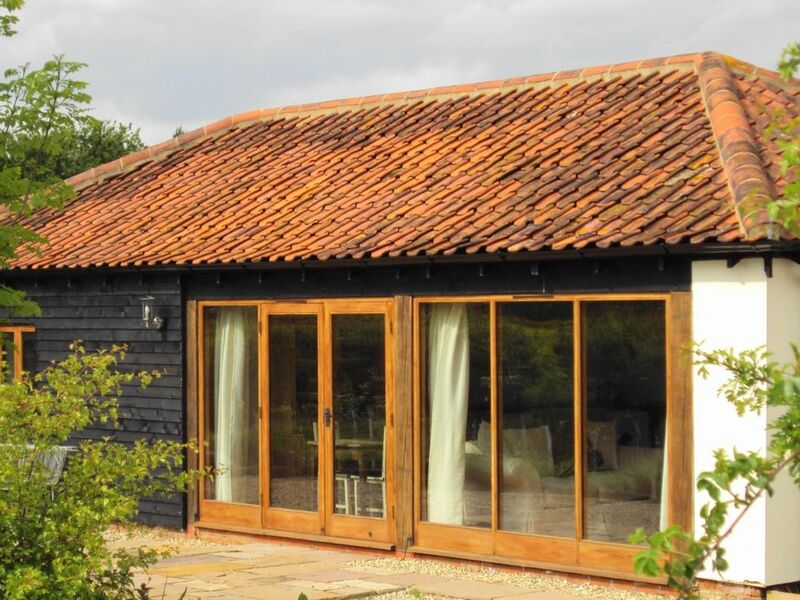 With easy access to the Broads, the Suffolk Coast and the City of Norwich, Stubbs Barn Cottage is within easy walking distance of the village of Loddon. The village has pubs, restaurants and shops as well as all the necessary facilities such as post office, bank and doctors. There are plenty of footpaths, offering easy walking in the South Norfolk countryside. Stubbs Barn Cottage is a converted cart shed, which has two bedrooms, bathroom, and a spacious and airy open plan lounge/kitchen/dining area. With tasteful yet practical furnishings and pictures by a local artist, we hope you will find it comfortable and relaxing. The cottage faces south and has large windows looking out over the top paddock, trees and fields beyond. With it’s own patio it is the ideal location to relax and watch the wildlife, listen to the birds singing, unwind and just enjoy those big Norfolk skies. The cottage is kept cosy in the winter by underfloor heating from a ground source heat pump, electricity is generated from a 6Kw windturbine and hot water is provided by solar panels. Your hosts Martin and Jane, are keen gardeners, and will be happy to share seasonal produce with you. They have successfully transformed the farm yard concrete to grass and gardens, including a kitchen and herb garden, orchard, reed bed, natural and ornamental ponds. Our small flock of Norfolk Horn sheep graze the paddocks, chickens provide fresh eggs, while honey bees (kept some distance from the house you will be pleased to hear) work tirelessly to produce local honey. The local village of Loddon has something for everyone, from pubs and restaurants to river trips and wildlife walks. While 20 minutes by car will find you in the cathedral city of Norwich, with shops, restaurants and museums. Close by are the historic towns of Beccles and Bungay and within easy reach is the Suffolk coast and the picturesque town of Southwold, home of the famous Adnams brewery. The RSPB bird reserves at Minsmere and Titchwell are both within reach, while other local reserves such as Strumpshaw, Wheatfen and Hickling offer excellent opportunities to see local wildlife. Bathroom has bath with shower over, sink, wc and heated towel rail. Two comfy sofas, armchair and coffee table. A welcome pack including milk, eggs, bread, muesli, butter and preserves is provided on arrival. Open plan kitchen is well equipped. Open plan dining area with four chairs with french windows, opening to patio. Additional chairs available. The cottage was fine had everything you needed for a holiday. Location perfect for sightseeing. Revisiting the area last seen on a broad boat in 1982. If walking to the local town of Lodden, note you have to cross the busy A146 to reach and can take 35 mins. In the summer would probably be OK, but autumn months, gets dark early evening. Overall great time seeing Norfolk and Suffolk, the county boundary only 6 miles from the property. Great pub 6 miles left on A146 The Gull Inn, fabulous food and a couple of quirky things to see inside. Also try get to The Gunton Arms in Thorpe Market; visit: Wroxham/Hoveton; Potter Heigham and Southwold to name just a few places. Book now if wanting a great location and property in Norfolk! A brilliant place to stay, so lovely and peaceful. stay there. The barn itself was very clean, everything you would require in the kitchen etc, including a lovely welcome package. thank you to Jane for a great stay!! Very comfortable, everything you could possibly need. Stubbs Barn was a very comfortable accommodation, very quiet and private, the proprietors were very friendly and we had literally everything we needed. We were very close to Norwich, Great Yarmouth and the Broads and had no trouble being able to see everything we wanted to with ease. Would definitely be happy to return or recommend this property. We found the house to be comfortable, well equipped and clean. We were pleased to be gifted with fresh bread, eggs, jam, muesli and butter, which was a lovely start to our stay! The property is located on a small farm/small holding and is very quiet and peaceful and yet still close enough to walk to Loddon for supplies and a pint. The garden is private and equipped with a table and a couple of chairs as well as a BBQ - though it isn't enclosed so it is worth bearing in mind that you need to supervise your kids as there is a pond nearby. The open plan kitchen, dining and living room was perfect for us as our daughter could run around freely. The kitchen has just about everything you need - even detergent for the washing machine and dishwasher! The location was perfect for us to explore the Eastern coast of Norfolk and Suffolk and the Broads (we particularly enjoyed Southwold and the beach full of seals at Horsey). We would happily recommend the property to couples or small families and would stay again if holidaying in the area in the future. A very comfortable cottage with everything you could ask for! A lovely clean comfortable cottage. We were welcomed with home made bread, home made jam, butter, tea, coffee, milk,six fresh eggs and muesli which was much appreciated., We would recommend this cottage to anyone wishing to stay in this area of Norfolk. Lovely property in quite spot, nice touch of home baked bread, milk and eggs from the resident hens. Thank you Jane for an enjoyable stay. Ideal location for the coast, the countryside and Norwich. In the immediate area, Loddon has a great deal to offer – boat hire is available from Loddon staithe with access to the river and broads network. It is a great area for walking and cycling and the Wherryman’s Way, a 35 mile recreational route, is close by. Norfolk and Suffolk are renowned for their beaches with beautiful sand, shingle and dunes. The region boasts several Blue Flag beaches, while further a field there is Southwold, Dunwich Beach and Heath. The historic market towns of Beccles and Bungay are less than 10 miles away. Both are on the beautiful river Waveney and offer a range of local shops, museums and attractions. Bungay has a market on Thursday and bustling street fairs for keen gardeners in the summer and festive Christmas shopping in the winter. Please note I do not accept payments through any websites. When you book you will be sent a booking confirmation form with direct payment details. If you have any queries contact me direct at jane@stubbs-barn.co.uk. In general Saturday change over with arrival after 2.00pm and departure before 11.00 am - but alterations to these times on request. Weekend and short breaks are available - please contact the owner for details.